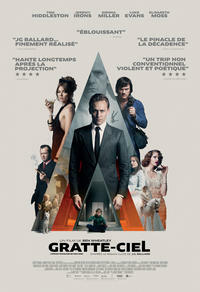 Affiche du film High-Rise - SVbiz Inc.
Une scène du film High-Rise - SVBiz Inc.
Les images, à la fois violentes et crues, marquent durablement plus qu'elles ne choquent. On ressort de Gratte-ciel assommé, désorienté, ne sachant pas trop comment aborder ce long métrage complètement fou, mais qui possède néanmoins un goût de «revenez-y». Brillant! On retiendra d'High-Rise une reprise d'ABBA par Portishead, enregistrée pour le film, peut-être le seul élément franchement réussi d'un film qui essaie beaucoup mais n'accomplit aucunement ses objectifs. Rarely have so many classy ingredients added up to such a muted, muddled, multi-storey mess. The movie retains Ballard’s not-uncheerful mordancy, and brings home his conviction that what we convince ourselves to be the best of all doesn’t need much of a tilt to become the absolute worst. A tour-de-force of visceral imagery and subtext, High-Rise is pulverizing, powerful, and brazenly idiosyncratic, in a style that’s gloriously rare, especially for modern cinema. 'Crash' novelist J.G. Ballard's 1975 tower-block thriller provides a retro battlefield in which Brit genre rebel Ben Wheatley can run amok. In Ben Wheatley’s sleek adaptation of the J.G. Ballard novel, the wealthy residents of a futuristic apartment building savagely turn against each other. Tom Hiddleston kills his way to the top in this adaptation of J.G. Ballard's dystopian cult novel.